This post has 2,633 views. This Thanksgiving/Black Friday I bought a new vehicle GPS. No, my nuvi 1490LMT isn’t broken. I bought this new GPS for my parents. 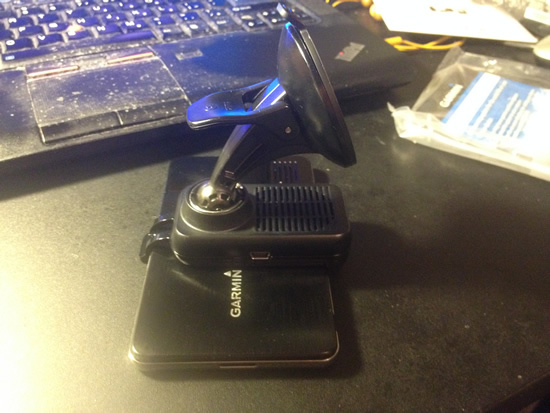 I was originally thinking of getting a Garmin nuvi 2455LMT or 2555LMT, but there was an Amazon Lightning Deal on the higher-end Garmin nuvi 3490LMT so I decided to try get buy it. Of course, I had to open up the box and test if the GPS works, and here are my first impressions. The Garmin nuvi 3490LMT waiting to be opened. 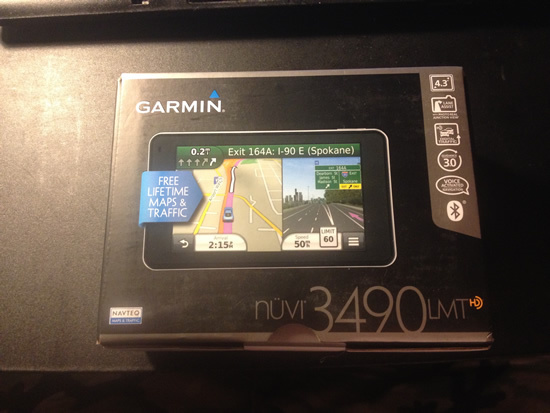 The Garmin nuvi 3490LMT comes in a small box which has a picture of the GPS on the top and a bunch of feature text on the sides. The packaging is decent enough, and they did a good job packing the the contents. 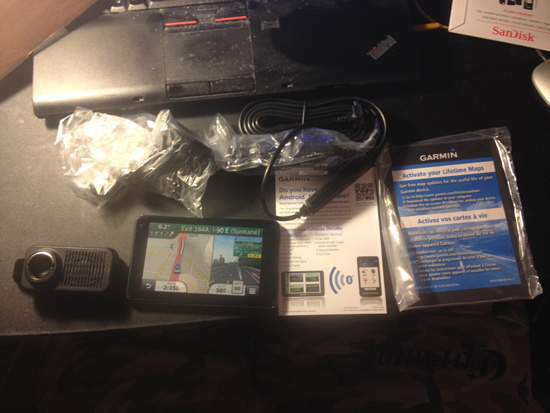 Opening the box, we find the GPS itself on the top, and underneath we find the powered mount, the suction cup, a micro-USB cable for connecting to the computer, the car charger which ends in a mini-USB connector, and the quick manual and other information pamphlets. The 3490LMT is from Garmin’s high-end 3xxx Prestige Line of vehicle GPS units. The 3490LMT is not the newest model of the series, but being a higher-end product it still possesses certain features not seen in the lower 2xxx, 1xxx and Essential series. The industrial design on the 3490LMT is very sleek, and it looks like high-end smart phone. Compared to my 5 inch 1490LMT, the 4 inch 3490LMT is smaller in all dimensions. In particular, the 3490LMT is only about half as thick as the 1490LMT. The casing is also mostly metal and very reflective, and the construction feels solid. It certainly looks nice, but the shininess attracts fingerprints. The 3490LMT and 1490LMT side by side. The 5-in 1490LMT is noticeably larger. The back of 3490LMT is a lot shinier than the 1490LMT’s matte black casing. 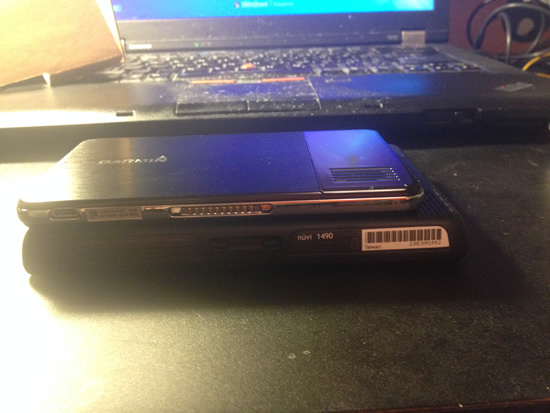 The 3490LMT is a quite a bit thinner than the 1490LMT. Unlike the 1490LMT which uses it mini-USB port for both data and the car charger, the 3490LMT has a micro-USB connector for data, but it has a special port on the middle of its bottom side to connect to its powered mount. 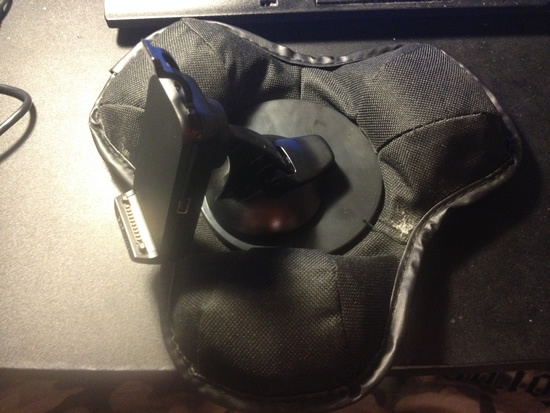 The mount is called a powered mount because the car charger connects to the mini-USB socket on the mount, and not directly to the GPS itself. The power mount has the ball socket on the back where the suction cup can be connected. The 3490LMT connected to its powered mount and suction cup. Like the 1490LMT, the 3490LMT also features a microSD slot for extra storage for large maps and other files. I picked up a 16GB microSDHC card for that purpose, but then I found that the 3490LMT has about 8GB of internal memory which, for now, is able to store the entire North American map. My 1490LMT only has 2GB of internal memory, so I have to install the map on the microSD card. The 3490LMT also has all of the features of my 1490LMT, which include the Lifetime Map and Traffic Updates, Junction View, and Bluetooth phone connection. However, the 3490LMT also can be oriented in portrait mode, supports some multi-touch gestures, has a smart phone app connection ability, and most importantly of all can be operated by voice command. The voice command feature is the reason why I decided to buy this model, and it works pretty well. To use the voice command, the user can just say “Voice Command” (the phrase can be changed) to activate the voice command menu, and the GPS will display a list of commands on screen. 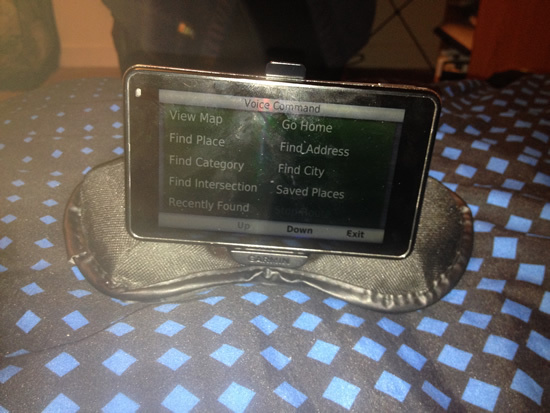 The user can then say the commands to proceed, and can speak addresses or place names for the GPS to search. From my experience, the voice recognition is pretty good, and all of the addresses/place names I’ve tried so far was correctly recognized by the device. When using voice command, the user still has to look at the GPS to see the menu items or remember the menu items, but at least he/she doesn’t have to reach for the touch screen which is a convenience. The 3490LMT showing its voice command menu. 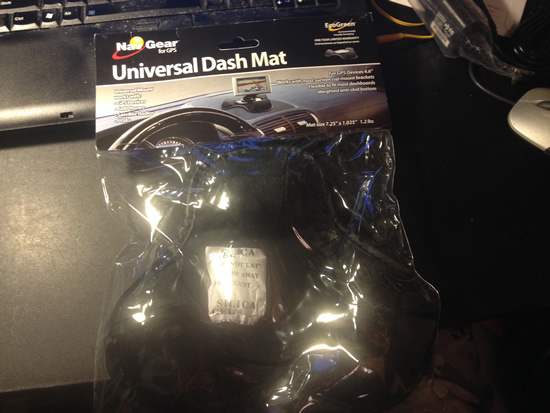 I’m not a fan of mounting the GPS on the window, so I also bought a friction dash mount to go along with the 3490LMT. This friction mount has the three bean-bag design that’s a little different than the one that I use for my 1490LMT, but it works just as well. 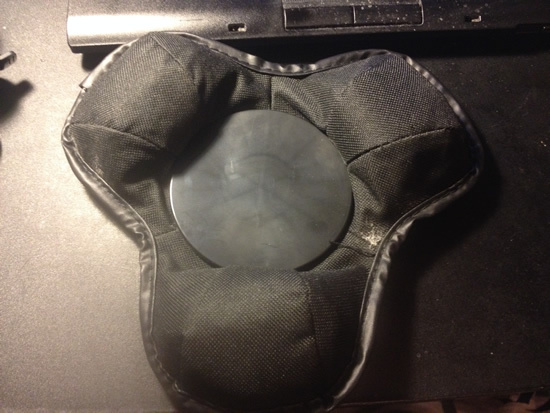 The new dash friction mount still in its bag. Here is the new friction mount once packaging has been removed. Sticking the suction cup onto the friction mount. I took the 3490LMT on a fairly long drive that involved driving 2.5 hours each way on an Interstate and so city driving. The 3490LMT performed pretty well for the most part, and the voice command is convenient and simple to use. It did have little trouble pinpointing my car’s location when I was in a downtown are with tall buildings and cloudy/rainy skies, but otherwise everything worked as expected. 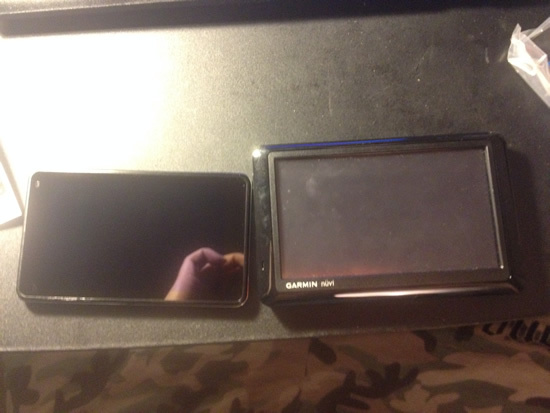 As a first impression, I’m pretty satisfied with the Garmin nuvi 3490LMT. 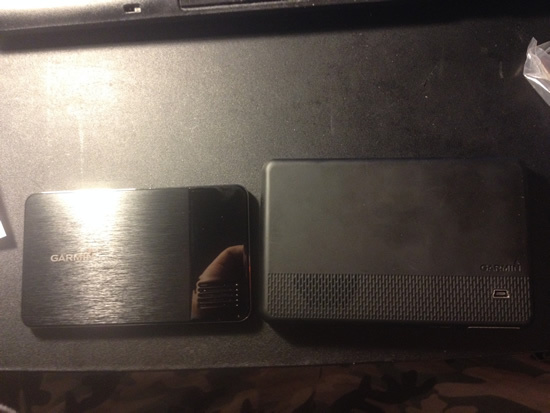 Hopefully the device will last a long time and my parents can get some good use out of it.